The Canberra Stadium is a stadium in the Australian capital Canberra. It is located in the Bruce area adjacent to the Australian Institute of Sport, was initially named after the former Prime Minister Stanley Bruce and is mainly used for rugby matches. The sports complex is equipped with seats and offers on the ranks 25,011 places for the visitors. The largest number of audience was however, 28,753; this was achieved in the final of the Super 12 Rugby League in 2004. The main grandstand of the Canberra Stadium is League players named time Meninga after the legendary rugby, at the entrance to the grandstand is a statue of the player Laurie Daley. 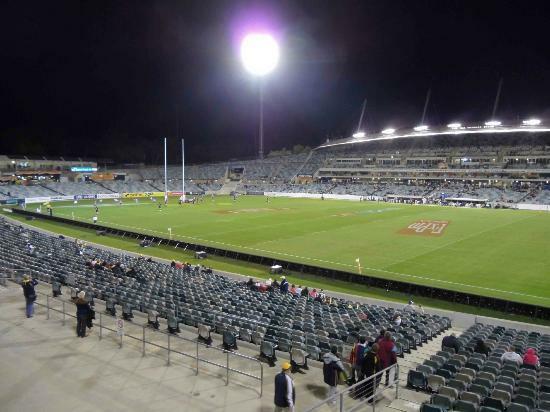 Currently, the stadium is one of the Australian government, which it has leased by the Australian Sports Commission to the Government of the Australian Capital Territory (ACT ). The current lease runs until 2010; the Government of the ACT strives to pass through exchange of land with the Australian Government in the possession of the stadium. The stadium was built in 1977 with an initial capacity of 8,000 seats to host the Pacific Conference games. During the first years found here regularly athletics competitions held. On October 6, 1985, the East German Marita Koch during the Athletics World Cup set a world record in the 400 - meter race on which remains valid even today. Previously, the stadium was expanded in terms of this competition to a capacity of 11,500 seats. The Canberra Stadium was the home of several local sports clubs such as the Canberra Arrows / Cosmos ( soccer) and the Canberra Bushrangers (baseball). After removal of the track and field facility in 1990, the Rugby League team Canberra Raiders moved in, followed in 1996 the national rugby union team Brumbies. 1997 was carried out with regard to the discharge of some games of the football tournament of the 2000 Summer Olympics in Sydney a basic renovation and expansion of the stadium. The total cost of the renovations amounted to 82 million AUD, almost seven times as much as originally estimated by the government of the ACT. The ensuing controversy led two weeks after the end of the Summer Olympic Games to the resignation of Kate Carnell, the former Chief Minister. The stadium was in the years 1981 and 1993 Venue of the discharged each in Australia Junior World Cup. Also during the Rugby Union World Cup 2003 some preliminary matches were held here. 2015 the stadium venue for the Asian Cup. End of October 2013 it was announced that the naming rights were sold at the stadium on the insurance company GIO Insurance Australia. It is the first sponsorship agreement for the stadium name. The value of the four-year contract is about 255,000 euros ( 350,000 AUD ). 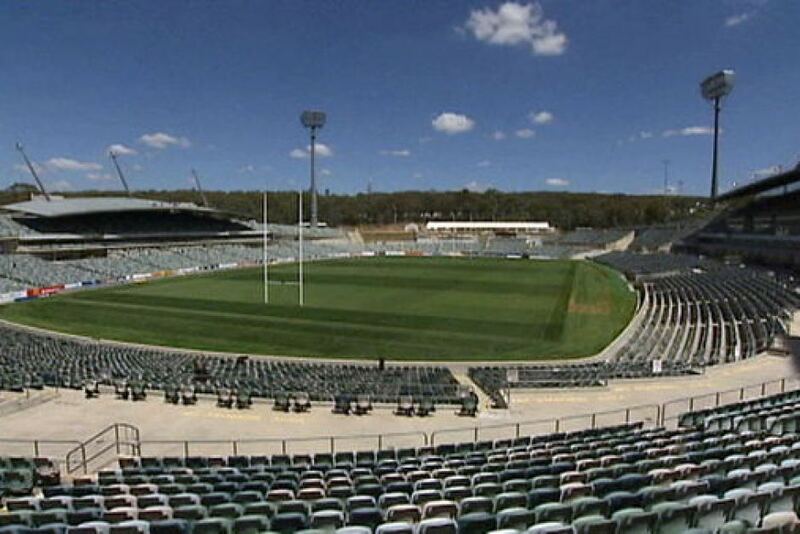 From 1 January 2014, the sports complex has been officially named GIO Stadium Canberra.